“AIR Talks” is a periodical event organized specially for Pro Helvetia Artists in Residence to present their work and speak about their practices, processes, histories, and experiences. 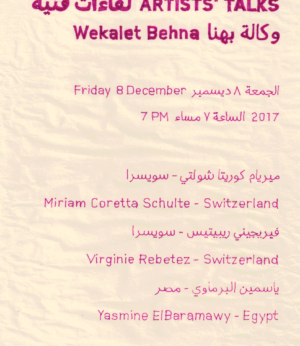 Participants of this event are artists who carried out their Studio Residency in Switzerland and Egypt this year and the year before. The evening starts at 19:00 with the artists’ presentations, followed by a discussion moderated by Egyptian visual artist and academician Shady El Nashokaty. Pro Helvetia Cairo offers Studio Residencies [3 months] In order to enhance cultural exchange and artistic collaborations between Switzerland and the Arab region. The aim of the residency is to find inspiration, establish networks and contemplate new projects. Residencies are offered in Switzerland for artists and cultural practitioners (e.g. curators, event organizers, mediators) from the Arab Region. At the same time, Swiss artists and cultural practitioners in the areas of music, literature, visual arts, design and interactive media, theatre and dance are eligible to apply. Call for Studio Residencies opens every year in December and lasts for three months.